This Poinsettia Heights home at 1756 Verdin Court sold in less than three weeks back in 2003, and at that time we set a record for the highest price ever paid for this 1720 square-foot model: $446,000. 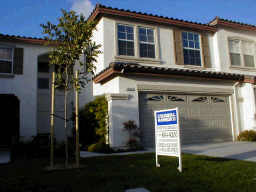 And what a Carlsbad listing it was–with a great story to boot! This highly upgraded Poinsettia Heights town home with views over Carlsbad to ocean was nothing short of what San Diego real estate buyers were seeking in those days. The wife, in decorating this Aviara home, dismissed all costs. She buffed it out with new diagonally-laid tile flooring downstairs, new granite kitchen, marble master bath, and a powder room whose ultimate cost had yet to be revealed to the husband. To appease him and redirect attention, another king’s ransom was spent on the garage with gleaming epoxy flooring, tool cabinets and over-the-top garage storage. Located adjacent to the Carlsbad community of Aviara, this is a gated community near parks, the South Carlsbad State Beach, good schools and shopping. For current availabilities in gated Poinsettia Heights, call Mike or Roberta Murphy at 760-402-9101/9102 or toll free at 877-818-8197. Based on information from California Regional Multiple Listing Service, Inc. as of April 22, 2019 08:29 and/or other sources. All data, including all measurements and calculations of area, is obtained from various sources and has not been, and will not be, verified by broker or MLS. All information should be independently reviewed and verified for accuracy. Properties may or may not be listed by the office/agent presenting the information.